Biofuel from food plants like corn is simply a bad idea  it does little to reduce carbon emissions, and drives up grain prices. Advanced biofuels from cellulosic material  plant waste and wood  are better, because they don't compete directly with food, but they still need reasonably fertile land in which to grow. Algae  microscopic plant-like organisms that feed on carbon and produce oil that can be used to make fuel  don't have that problem, and that could make them the perfect biofuel. 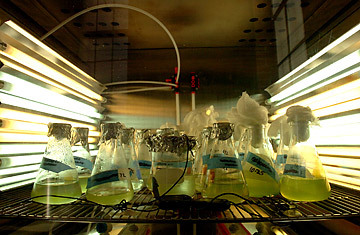 Algae can be grown on waste land in plastic tanks called bioreactors, with little more than sun, heat and water  and the water can be salty, which leaves freshwater for food crops. Even better, algae could efficiently absorb the carbon being put out by fossil fuel power plants, producing a biofuel that is close to being carbon neutral. Algae biofuel is still some way from commercialization  a gallon of the stuff costs as much as $20  but the technology is progressing. One start-up, Algenol, has plans for a 100 million gallon a year facility in northern Mexico's Sonora Desert.